23 Feb Why Apple Cider Vinegar? A few weeks back I posted a picture on Instagram of my morning “tonics”. I got a lot of questions about Apple Cider Vinegar and what the health benefits are. So today I wanted to share with you just what those bennies are and why maybe you should consider adding ACV to your daily routine! I first learned about Apple Cider Vinegar from a client who inquired about the “Apple Cider Vinegar Diet”. Whenever I hear the word diet, I typically turn up my nose, but decided to do my research and found an overwhelming amount of research and health benefits to this age old solution! I found that it is recommended to consume 2 tbsp of raw, unfiltered ACV a day and typically it is recommended to add it to a cup of water, because I will warn you – this stuff is potent. Lucky for me, I actually like..love vinegar, so I could easily take a shot of this stuff – (but don’t, because it can mess with your tooth enamel and tissues of your throat, due to it’s highly acidic nature). Most people on the other hand, not so much. So even adding a little fruit juice or honey could help make it go down the hatch a bit smoother. Does it matter what kind of Apple Cider Vinegar I use? Yes! You want to use a raw unfiltered variety that contains the MOTHER. Yes, the holy mother is key, because that’s where all the good stuff is. The mother is the sediment at the bottom that will most likely freak you out at first, but just shake it up and it’ll mix in quite nicely. Like I said, this mother contains the good stuff. It’s made up of strand like enzymes of protein molecules with live-in bacteria and nutrients that are oh, so good for us! There are many brands out there, but the most common is Bragg’s Apple Cider Vinegar, which nowadays can really be found at almost any grocery or health food store! 2 tbsp + cup of water. Remember, Be sure to dilute it! Lastly, mixing it with olive oil for a simple salad dressing! Most importantly, why am I drinking this/what are the benefits? – Help soothe sore throat and/or fight congestion caused by colds and allergies. ACV contains malic acid which gives it its antibacterial/antifingal properties (along with honey, so add that for an extra punch) that work to help you heal a sore throat. It also helps break up mucous and sinus congestion. – One of the main reasons I started a ACV regimen, balance digestive system! Enzyme rich ACV helps reduce gas and can combat constipation by stimulating digestive juices that help breakdown food. Also, since research suggests that heartburn is caused by low stomach acid levels, a dose of apple cider vinegar brings that level up to alleviate symptoms. **Especially good for preggos who may not want/can’t take medication. -Rich in acetic acid. This acid is said to slow the digestion of starch, which can help lower the rise of blood glucose post meal. –Can help clear up skin conditions and blemishes. Not only working from the inside out, apply diluted ACV to a washcloth for an all natural astringent. Can help make skin feel smoothes, reduce fine lines, and absorb excess oil. Leave a dab on a pimple or age spots/scars to help reduce their appearance. –Rich in potassium which lends itself to a whole host of benefits. These benefits include, preventing brittle hair, teeth and nails + building new muscles, tissue growth and transmission of nerve impulses. –Aids in maintaining proper pH levels in the body. Especially for someone who consumes a lot of alcohol or coffee, ACV can help return the body to a more alkaline state, lower in inflammation. -Can help regulate blood pressure, cholesterol, and as already mentioned blood sugar levels. -ACV can help with weight loss by breaking down fats in the body to use them for energy instead of being stored. -Possibly neutralize the pain of sunburn by helping restore skins pH. 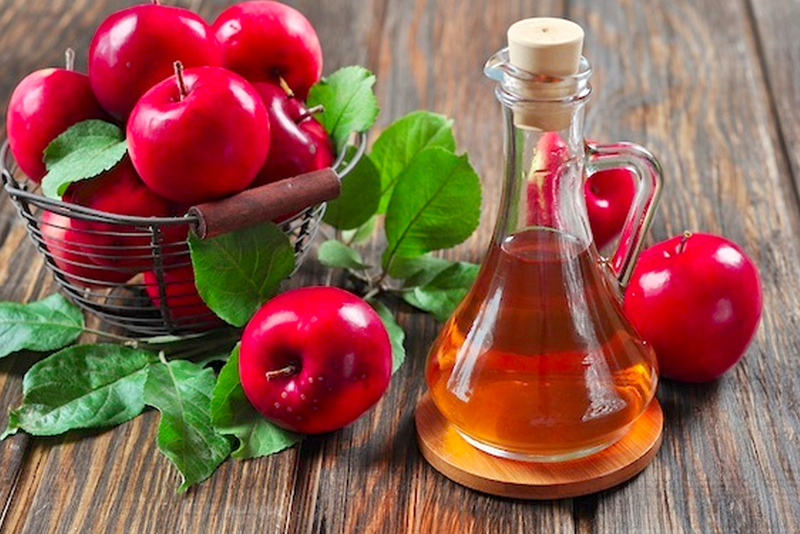 -ACV may reduce the appearance of stains and help whiten teeth! -In addition to all these (and more), Apple Cider Vinegar has MANY natural house hold uses. This stuff is just magical! Have you noticed any changes in your bod? I can’t say that there is an absolute direct link, but since regularly taking apple cider vinegar, my digestive issues (there were a lot) have since cleared up! I know this can be in conjunction with other things I have changed, but hey, I’ll take it. I also feel like my daily dose helps with energy levels, gets me drinking another glass of water (always important), and I must say my skin issues have cleared up! Additionally, when I feel a cold coming on I up my dosage to 3 times a days + hot lemon water & honey. I swear by it! Give it a whirl. Especially if you are experiencing any of the issues it can help alleviate! Then let me know what ya think!